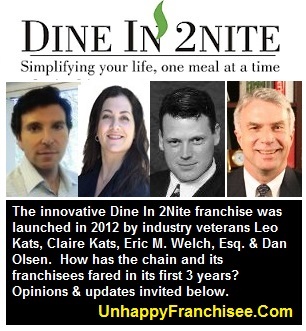 The Dine In 2Nite franchise was launched in 2012 by Leo Kats & Claire Kats, with management help from industry veterans Dan Olsen, Phil Mettra, and Eric M. Welch. Three years later, some Dine In 2Nite franchise owners claim that most of the 30-40 franchises that opened have now closed, that they received little to no support, and that the franchisor Leo Kats won’t return their calls. Is there any truth to these complaints? What IS the status of the Dine In 2Nite franchise program? Comments welcome. (UnhappyFranchisee.Com) Dine in 2nite began offering franchises in 2012. It seemed like an innovative concept: Franchisees would make and deliver gourmet-quality meals to consumers at home for just about $10 per meal per person. Dine In 2Nite franchise marketing touted (and still tout) the advantages of investing in the Dine In 2Nite: a subscription-based revenue model, lower labor, waste and overhead costs than running a restaurant franchise, relatively lower cost of entry, a Master franchise option that enabled a franchisee (for higher investment) to profit by developing an area, and a seasoned, experienced franchise support team. Leo Cats, President & CEO, has extensive franchising experience as President of Instant Imprints Franchising, Inc. from 2001-2009, and since 2007 as President and CEO of FranVest International, Inc., a firm that offers brand and franchise development as well as consulting and management services for emerging concepts. Eric M. Welch, Esq. – Vice President and General Council. Attorney Eric Welch also has extensive franchise experience as Vice President and General Council for Instant Imprints Franchising, Inc. from November 2005 to March 2011. …the total investment necessary to begin operation of a single Dine In 2Nite franchise ranges from $49,700 to $58,500 for a shared kitchen model and $99,900 to $157,750 for a full kitchen. This includes $34,950 that must be paid to the franchisor or affiliate…. We have received some anonymous franchise complaints alleging the nearly complete failure of the Dine in 2Nite franchise system. We don’t know if this or the other franchise complaints listed below are valid, so we invite the company and others to respond either below or by contacting ADMIN at UnhappyFranchisee[at]Gmail.com. Dine in 2Nite has gone from over 20 Franchisees to 4 left open. All the rest have closed down including Master Franchisees. Going from a count of Franchisees of between 20- 30 including Master Franchisees to only four left speaks volumes. This organization has been unresponsive to its franchisees almost since day one. They have always been very vague when asked direct questions and often do not return calls from franchisees. There was supposed to be a 24 hour call center that stopped after a few months. The website was not user friendly. The person responsible for helping the franchisees with artwork for marketing material was let go so we had to try to do all ourselves. We are getting zero support from Dine in 2nite. We used to have conference calls etc. Now we try to contact Leo whose mailbox is constantly full so we have/had to count on emails. He would takes his time with responding if he does at all. It’s a horrible situation. We have received complaints that Leo Kats and Dine In 2Nite unlawfully sold unregistered franchises in states that require prior registration, including California, Virginia, Washington and Wisconsin. There are countless complaints regarding the Franchisor including the fact that he didn’t register in at least one State that that we know of where he sold Franchises in. We have not looked further to find out how many more States or if any were registered. He does have a Cease and Desist order against him in the State of California. Not only was Dine in 2nite not registered to sell in one of the registration states I checked with, but they had applied for registration and were denied. They went on to sell a franchise there. They also sold a Master Franchise there. I checked with another state agency and they said they had never registered there either. They sold a single unit and a Master Franchise there too. The complaints that are sent to corporate office are replied with insults. Many franchisee’s have asked for their franchise fees to be returned. He has refused. Leo and Claire Kats have also gone on to another business – called Myst Parties – AND are still “operating” Dine in 2nite. Have Leo & Claire Kats Abandoned Dine In 2Nite Franchisees? Dine In 2Nite franchisees feel that they’ve been abandoned by Leo Kats and Claire Kats. They feel the Kats are focused on new business ventures. In 2014, Leo & Claire Kats lost a 6 month legal battle with the landlord of their a kid’s party facility called Tee Party. The Kats’ unsuccessfully appealed. It appears they spent considerable time and energy rebuilding and renaming their party facility concept Myst Parties. No mention of whether the Katz are intending to franchise Myst Parties or any of their other ventures as of yet. Responses, rebuttals, clarifications invited! Please comment below or contact us via email. ARE YOU FAMILIAR WITH THE DINE IN 2NITE FRANCHISE OPPORTUNITY & ITS MANAGEMENT TEAM? DID THIS TEAM OF FRANCHISE VETERANS VIOLATE STATE FRANCHISE LAWS? IF SO, WHY? ← Did Leo Kats, Dine In 2Nite Franchise Violate State Franchise Laws? If so, Why? Everything you state in this article is true. I bought into the Franchise around 2013 in PA and quickly discovered that Leo and Claire were disinterested and focused on other business initiatives. My impression was that they were only interested in getting the Franchise Fee and did little to deliver anything that they promised. I would watch carefully and with much skepticism anything that they do in the future.